I've discussed the role of the Internet in creating and propagating lies in a previous post, noting that Donald Trump lied more frequently than Hillary Clinton or Bernie Sanders during the campaign. 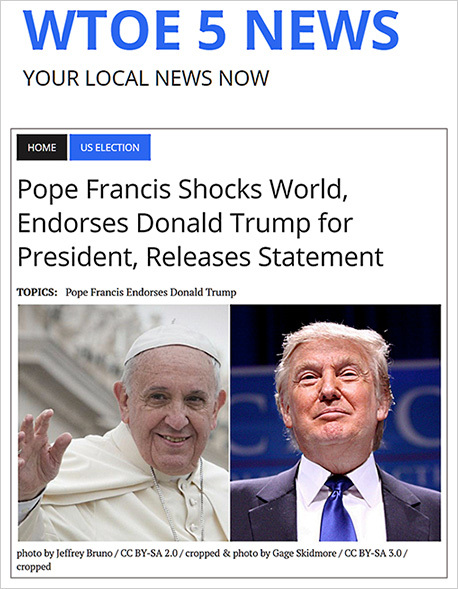 Now let's look at fake news like the claim that Pope Francis had endorsed Trump. The fake post features the following image and includes a "statement" by the Pope in which he explains his decision. The post evidently originated from the website of a fake news station, WTOE 5. 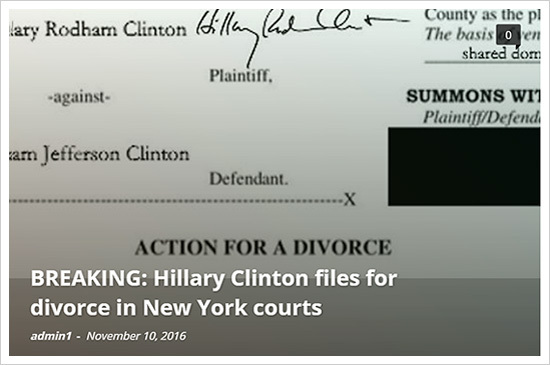 Avarice, not politics, seems to be the motivation for the site since it is covered with ads and links to other "stories" that attack both Clinton and Trump. Christian Times Newspaper is your premier online source for news, commentary, opinion, and theories. Christian Times Newspaper does not take responsibility for any of our readers' actions that may result from reading our stories. We do our best to provide accurate, updated news and information. Given the WTOE 5 claim to be satire or the Christian Times eschewing responsibility for actions taken by readers, I suspect that unless Pope Francis or Hillary Clinton sues, there is no legal recourse. 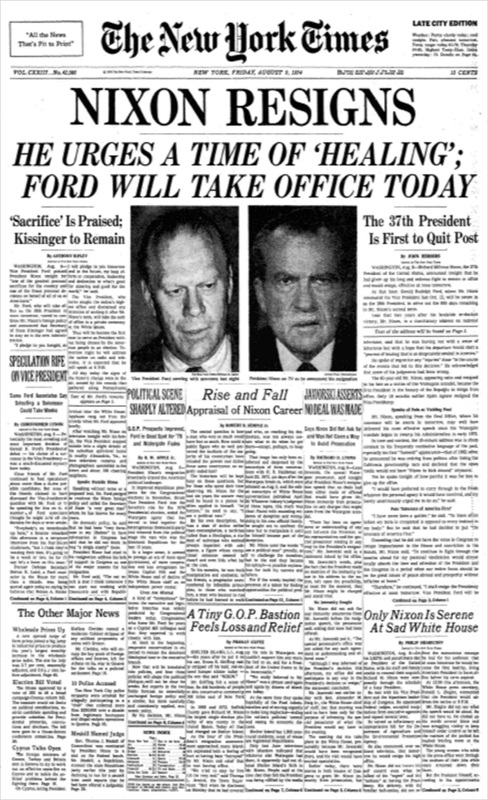 The dirty tricks during this election remind me of the Watergate burglary, but, unlike Watergate, it is not clear that a law has been broken. In the Watergate case, a crime was committed and the burglars were convicted and sent to prison in 1973. In 1974 investigators were able to establish a White House connection to the burglary and, under threat of impeachment, President Nixon resigned. Would it be possible to establish a connection between a website like "WTOE 5 News" and the Trump campaign? 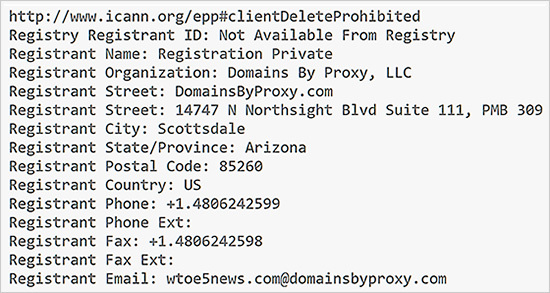 A Whois query shows us that the domain name Wto5news.com was registered by DomainsByProxy.com. We can see the address, contact information and names of people at DomainsByProxy.com, but the identity of the person or organization registering the domain name is private. I also checked the Whois record for the Christian Times. It turns out that DomainsByProxy.com is also the registrar for Christiantimesnewspaper.com and the registration is also private. I am not a lawyer, but I suspect that a request for a subpoena to get the contact information of a long list of people registering domain names for misleading websites would be seen as a "fishing expedition" by the courts. I understand the wish to protect the privacy of a person or organization registering a domain name, but there is also a public interest in discouraging sites like Wto5news.com. A verifiable, real-names policy for domain registration would discourage this sort of thing. The WELL, an early community bulletin board system, adopted such a policy years ago. Their slogan is "own your own words” and it serves to keep the discussion civil, stop bullying and lying, etc. Trump supporters seem to worry a lot about voter fraud. They advocate easing mechanisms for challenging a voter's registration and encourage strict requirements for proof of identity and residence. There is more evidence of demonstrably fraudulent political information on the Internet than fraudulent voting. If their concern is genuine, they should support a real-names policy for domain registration. If warrants will not pass legal muster and a real-names policy is unrealistic, someone might be tempted to follow the example of the Trump supporters who hacked the Democratic National Committee and resort to hacking registrars to get contact information of their private clients. Maybe Julian Assange could distribute what they find on WikiLeaks. BuzzFeed blew scam this wide open two weeks ago. Trump supporters either a) wouldn't know what Whois is or b) know what Whois is but don't care about whether the article is true or not, so long as it supports their guy or makes the other guy look bad. True — there have been tons of stories on the fake sites and lies, but few suggestions as to what to do about it. A true-names policy is one small (and controversial) measure. I think prominent buttons on Facebook and other posts to crowd-source junk might also help as well APIs on fact-checking sites to let Facebook, et al, look for likely fakes. What else? You're assuming people care about truth. They clearly don't. Some do; some do not. We all confabulate to an extent, but I like to think I would pay attention to a fact-checker calling out a fake pro-Clinton post. (Note that politifact shows that she (and Bernie Sanders and President Obama) lie sometimes — just not nearly as frequently as Trump: http://cis471.blogspot.com/2016/09/lying-crooked-donald.html). Winston Churchill, Harvard University, Monday 6 September 1943.
what else is to be concluded from this but that you first make thieves and then punish them?" The problem starts when I allow someone else to think for me, to perform my research for me. I am not interested in having others "do for me", nor should anybody else. This is accepting responsibility for self. Priestcraft, regardless the discipline, is the illusion that we are dependent on others to "do for us", and thus we become their slave. Larry, is this article meant to be an expert opinion, or just an opinion? Everyone's entitled to their opinions, and I'm not inclined to argue against every single one with which I happen to disagree (life's too short), but if this is meant to be the expert opinion of a Professor of Information Systems, then I don't want to let it go unchallenged. Local Time: Wednesday, April 24, 2019 01:13 PM PDT – Page Load: 0.4748 Sec.